How does AQUA PATCH differ from other cold-mix asphalt products? AQUA PATCH starts to harden immediately after adding water. It also has excellent durability and the same eventual strength as that of hot-mix asphalt. How does AQUA PATCH harden? How is it different from conventional asphalt patch repair products? Conventional cold asphalt patch (volatile hardening type) Mineral-based lubricating oils are added during the mixing and manufacturing process to ensure sufficient workability at normal temperatures. The mix hardens as the lubricating oils volatilize after being applied. In actual repair scenarios, the lubricating oil often remains in the mix to some extent, leaving the patch soft for several months. AQUA PATCH (chemical reaction hardening type) A special lubricating oil is used instead of a mineral-based lubricating oil. The main feature of this lubricating oil is that it hardens when mixed with water and organic additives (added during the manufacturing stage). Adding the water to the mix during the installation process causes this special lubricating oil to undergo a chemical reaction with the accelerant, which hardens the repaired patch. The fast speed of this chemical reaction results in the mix quickly hardening. How does the temperature affect the chemical reaction? The mix hardens faster at higher temperatures. At temperatures below 32 °F, it is cold enough for the asphalt cement to harden without a chemical reaction. The mix holds frozen water inside and the chemical reaction will start again once the ice melts. There are no concerns about the entire mix’s durability. What type of situations can AQUA PATCH be used for? How thick should AQUA PATCH be applied in a hole? AQUA PATCH should be applied in layers of 1 to 2 inches thick. Apply AQUA PATCH in 2 layers if each layer exceeds 2 inches in thickness. The second layer must be applied immediately after the first layer, and twice the amount of water is added over the repair area. Tamp the entire surface. How about adhesion to the surface underneath (installation surface)? You can install AQUA PATCH over ordinary asphalt pavement. AQUA PATCH cannot be installed over steel, plastic, or concrete materials due to poor adhesive characteristics. AQUA PATCH can be used in either asphalt or concrete potholes. AQUA PATCH can be applied in a concrete pothole because it binds to the concrete edges through mechanical bonding. Can AQUA Patch be applied directly onto soil? It is not recommended to apply AQUA PATCH directly onto soil. Applying AQUA PATCH directly onto soft surfaces can cause sagging and premature cracking. If there is loose soil, tamp it down to make a firm foundation. Can AQUA PATCH be spread out thinly? AQUA Patch cannot be used in a thin layer, so it should not be spread over a shallow hole. The minimum depth requirement of the hole is 1 inch. If the hole is greater than 2 inches deep, apply multiple layers of AQUA PATCH, add water, and compact the layers together. What machinery or equipment is required during the installation process? The mixture can be compacted by stepping on it, so only a shovel and water are required. Using mechanical compaction (such as a plate compactor or tamper) helps to improve durability. How much and how do you apply the water over the repair area? Water should be applied as evenly as possible using a funnel or plastic water bottle. It is advised that 1 quart of water is required per bag, but there are no issues using more water exceeding this amount. Can AQUA PATCH be applied if it is raining? Yes, you can use it in the rain. Note that the mixture will harden in rainwater, so it is recommended to quickly compact the material after application. Do water puddles need to be drained before starting repair work? It is not necessary to drain the puddles. You can use the water in the puddles and add less water before compacting AQUA PATCH. Can AQUA PATCH be applied in winter? You can apply AQUA PATCH as long as the temperature is higher than 14 °F. Note that the water being applied should be kept warm (at normal room temperature) within the work vehicle. Are there any issues handling AQUA PATCH with bare hands? No, it is safe to touch AQUA PATCH with bare hands. To protect from dirt, wear gloves and protective eye wear when handling AQUA PATCH. How long does AQUA PATCH need to cure before it is ready for vehicle or pedestrian traffic? Sidewalks: 30 minutes See the technical documentation for details. 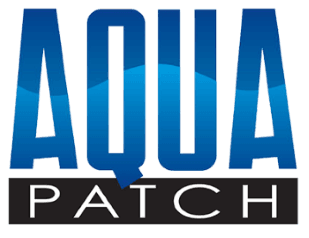 How long will AQUA PATCH last after being installed? AQUA PATCH will generally last as long as ordinary hot-mix asphalt. The service life of the repaired area can be affected by the volume of traffic, or by the structural integrity and extent of damage of the surface. The patch may become quickly damaged if the repaired area is structurally damaged, or if there is a lack of support (such as areas where there is major sagging along the finished surface due to vehicle movement, or from being applied directly on top of mud). Premature cracks may appear if AQUA PATCH is used over an area that is already cracked. What is the best way to store AQUA PATCH? Store bags of AQUA PATCH in indoor or outdoor areas that are out of the rain. Avoid direct exposure to sunshine and rain. What is the shelf life for unopened bags of AQUA PATCH? Six months from the date of manufacture. Can extra AQUA PATCH be used again after the bag is opened? It is recommended to use the entire bag of AQUA PATCH in one use. If you want to use any of the remaining quantity of AQUA PATCH, seal the bag properly and use it as soon as possible (within 1 day). Before reusing the material, check that it has not begun to harden.